The Power of Japanese Electric Power Service｜Japan Electric Power Service Co., Ltd.
Service is The Human Power of Staff. "Skill", "Cost", and "Added Value". with these three elements, and to respond the customers’ needs. What is the “Skill” of JEPS? Once a month from April to September, we hold a study session, where the senior staff play as the lecturer, in order to improve the skill and quality of construction techniques and inspection methods. We are a group that aims for acquisition of higher level technology and to be “Electric Doctors”. What is the “Cost Power” of JEPS? 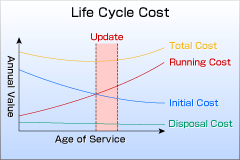 It is said that to minimize the cost required until the end of equipment life (the life cycle cost) is the way to achieve best overall economic efficiency (the total minimum cost). For certain period after construction, the magnitude of initial cost during construction is significant. 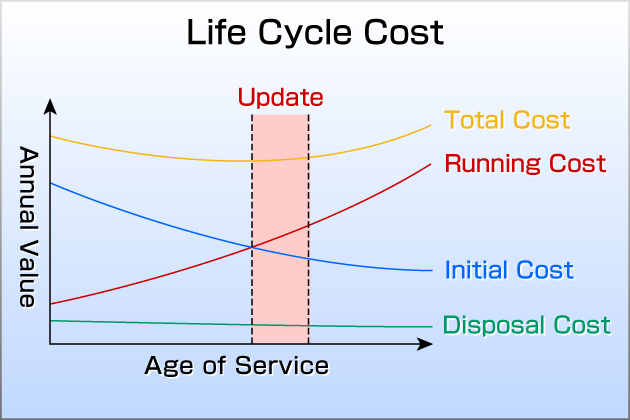 However, over time, the running cost increases. It is very important to propose how to lower this running cost. 2. Choose a reliable and low-cost repairing company. 4. Update / Renew when the total cost becomes lowest. 5. Periodically perform maintenance (more than once a year). Every year on July 1st, all the employees including the new faces present the results of the projects they took charge of. This develops the skill of cost management from the customers’ view. Moreover, appealing individual contribution by their effort leads to experience the participation in management. What is the “Added Value Power” of JEPS? ・We productize the reliability and low-cost by in-sourced construction. ・We contribute by integrating environmental maintenance and environmental conservation into our business. ・We have integrated technology from inspection to construction with cost consideration. ・We have established a total system of Planning → Design → Construction → Inspection → Maintenance → Testing → Repair/Renew. ・We continue providing comfortable tranquility on a round-the-clock basis. ・Our staffs are hard working. We perform a Safety and Health Committee Activity every month based on the Safety and Health Regulations, and hold a comprehensive Safety and Health Convention twice a year. We are seeking to be the safest company in Japan. We improve our sensitivity and awareness, and absorb each other’s way of thinking with flexible ideas by using a management magazine called “Principle and Management” as base material, once a month. We value exchanging opinions in discussion form to broaden our minds. And we perform sessions for "customer satisfaction".